We constantly save cost for our clients by make the installation process as easier as possible. 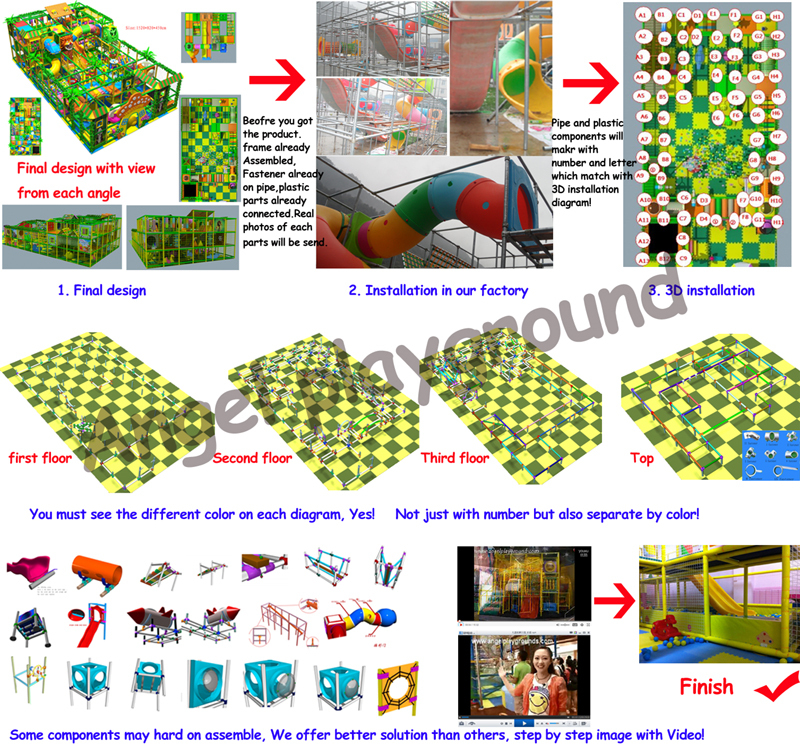 For very large indoor playground, (play structures) bigger than 150m2 and 4.5m high, installation will be done by our technician, we has dedicated, well-trained team who have the skills and knowledge to execute the installation, A proper installation is important for kids playground, have to consider safety, longevity and appearance look! we guarantee the installation details as clear as possible and immediately response during the installation if get any problem by Skype, phone, Whatsapp and email! First, Before delivery we will assemble iron parts and plastic parts in our factory, holes will be drilled, fastener will be screwed. Bridge will be put on, tunnel will be cut on right size! Second,we will take photos and send to our clients before residual payment. 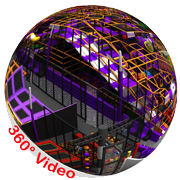 Third, we will mark numbers on parts then make 3D installation diagram, Number on 3D diagram match with components. 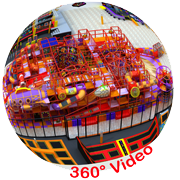 Check bellow video and Example, for more details information please send us email! 1, if the playground have three floor, you need to clean the place and put the EVA mat on floor first! If only two floor, you can assemble the frame first then lift the frame and put the EVA mat on floor. Do the installation one floor by floor, (floor one, floor two...). Start with the vertical pipe. Most of horizontal pipe are on size 113cm, that mean no need to find the one between A1 and A2, anyone with same length will be fine. 3, Join the horizontal pipe with (vetical pipe from first floor) by Fastener. All fastener already on the vertical pipe, (we have assembled before delivery and keep it on), If do have missing during delivery, find it on spare parts. Do not worry the height of horizontal pipe to ground, can be adjust any time. Compare the fastener on Iron pipe with installation diagram, All correct then go for second floor. 4, Assemble bridge on first and second floor, These bridge have horizontal pipe on it. Just move to the correct position and join to vertical pipe. 5,After finished all horizontal pipe, cover the top. On installation diagram many mark with many color, one color mean is whole piece. So all long pipe with out fastener on it are for top. "Turn Key Installations" are provided for those organizations that do not wish to participate in the playground construction process.? Angel Play construction experts will build your entire playground. From digging the first "post hole" to putting down the safety surfacing, we do it all! Before delivery to abroad, Angel play will assemble the full set and mark all parts with number. Just need to join the same number together to finish the assembly. Angel Play will provide a detailed installation instruction to organize your volunteers build the playground, lending expertise throughout the process. This will save your organization "hundreds" and, many times, "thousands" of dollars, when you utilize our knowledge plus your labor!